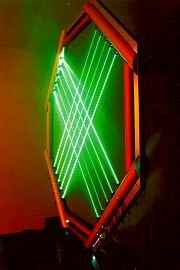 The laser harp is a musical instrument made of light. A fan of beams shoots up from the floor into the night sky. The performer can create music by placing their hands in the beams. Not only does “breaking” the beam produce notes, but sliding the hand along the beam will also change the sound. The harp does not produce any sound by itself, but creates MIDI data that can be connected to any modern synthesizer. 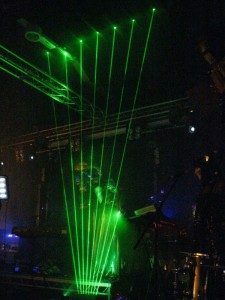 The laser harp concept was invented by Bernard Szajner and used extensively by Jean-Michel Jarre, and more recently Little Boots. I asked Geoffrey if he could explain a bit more about the operating principle, but so far I’ve not received a reply. If you’re out there Geoffrey please let me know! Note : The laser “harp” is not really a harp in the strictest sense, but a lyre. OK, so how can I build one…? It’s been about a year since I completed the first version of the laser harp. Many of you have bought the plans, and I would like to thank you for your support. One of the requests I received quite often was for a more step-by-step guide to building the harp. So I decided it was time for a rebuild, and that I would document the process as much as I could. I will try to show you how I build the laser harp as best I can, but there will still be times when you must reason things out for yourself. It’s a relatively complex project, and so an exhaustive step-by-step guide is beyond me. As I begin, I’m not even sure that some of these ideas will work, but after a year of gigging this unusual instrument I believe I can make a worthwhile update to the plans. I would also like to thank all the people that joined the forum and gave their feedback. Some of these pages have password protection on them – since many people have paid for the plans I can’t really give away that knowledge in a public forum. It’s my intention that some of the later pages will be public, as these contain new ideas and I would like to get as much feedback as I can. The laser costs the most – you can’t really use a laser pointer so you need something like this. The rest of the parts typically cost under $300. It took me about 3 months to put together my first “infinite beam” laser harp, the last one took about 3 days. I would expect it to typically take somewhere between this. If you are new to electronics, I recommend you buy a “breadboard” and lay out the parts of the harp on this before soldering anything. It will give you a chance to understand how the circuits are connected, and to make changes to the layout without too much trouble. 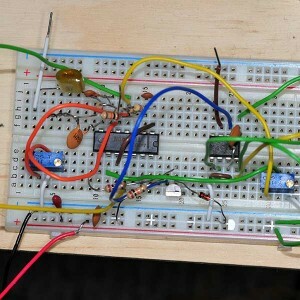 Once you have the circuits working on the breadboard should you think about soldering. I recently added the CAD files to create a printed circuit board for the laser harp – this will make building the harp much quicker and easier. You will need to submit the cad files to a manufacturer like www.batchpcb.com. “At the centre of the backdrop a giant skull gazed forebodingly over the throng. On the skittering Gothic spook-pop of Ghosts it established the requisite emotional temperature. As Hesketh shed her back shroud to reveal an all-gold outfit in the opening chords of New in Town, the skull responded accordingly, beaming rays of multicoloured light on to her back. However, the pièce de résistance came when the lights dimmed to reveal an arc of eight laser beams which, when intercepted by Hesketh’s hands, played different notes.